Climate change will have significant impacts in California not just on water supply, but also on water demand. A new, free tool from the Pacific Institute* helps water managers to forecast urban water demand with four global climate change models and compare different possible futures to the year 2100 by altering greenhouse gas emissions, population projections, conservation and efficiency measures, and more. The research shows climate change will cause increased water use in California’s cities and suburbs, even as water supply is expected to diminish. Urban water use – residential plus commercial, industrial, and institutional uses – accounts for over 20% of the water use in California, and up to half of urban water use is outdoors. The new report Urban Water Demand in California to 2100: Incorporating Climate Change describes how warming due to climate change is causing increases in water demand for landscapes, and will continue to drive up future water demand, particularly as more Californians settle in warmer, drier inland areas. The Pacific Institute ran a number of scenarios through 2100. The analysis finds that climate change alone could increase urban water demand in 2100 by 8% percent, or around 1 million acre-feet, under a medium-high greenhouse gas emissions scenario. That is the amount of water needed to satisfy the current household needs of 6.7 million Californians. The rates at which conservation practices are put in place, and the degree to which they are continued, have a major effect on future water use. California’s policy to reduce urban per-capita demand 20% by the year 2020 is likely to keep overall urban water use at or near current levels in the short-term. But beyond the 20×2020 mandate, urban water use rises quickly, increasing by over 5 million acre-feet from current levels to the end of the century under medium-high greenhouse gas emissions levels at a time when state agencies are projecting reduced water supply from snowmelt and runoff. The Urban Water Demand to 2100 model will make it easier for state agencies, water utilities, and others to explore scenarios of future water use and identify possible response options. The model can be customized to reflect local or regional population projections, development patterns, water uses, energy requirements, and expected savings from conservation and efficiency measures. Scenarios are not “predictions,” but rather tools to test hypotheses, data, and assumptions about future urban demand and potential response strategies. Scenario-based planning can help compare potential futures and different response strategies. 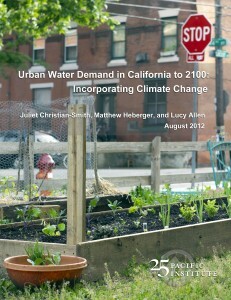 Download the Urban Water Demand 2100 model. System requirements for Model: Windows, Microsoft Excel and Access 2007 and up. NOTE: The Access database “Tables.accdb” must be kept in the same directory with Excel file. *A small number of users may require an additional database file to use particular features. If you select the “Custom Region” option and set the Climate Data Source as “Grid cell,” you will need to use a larger database with additional tables. This file (which is over 1 GB), and instructions for using it, are available on request. Please email: Matthew Heberger.